Save money on bags with this 14-lb., lightweight upright made for heavy-duty cleaning. From the easy-access dirt cup and 30-foot cord to the high filtration system, keep the focus on cleaning rather than maintenance. Easily combine an outer bag with the easy-empty dust cup. Sanitaire® Lightweight Commercial Upright Vacuum 12 wide cleaning path UL & OSHA Approved for commercial use Manufacturer's one-year parts/labor warranty for commercial use Economically priced! Powerful, 5 amp maintenance-free motor; polycarbonate motor hood. Micron Filter® System retains up to 99% of pollens and dust. 30-ft. three-wire grounded power cord. Weighs less than 15 lbs. Easy-to-empty E-Z Kleen® clear dirt cup. 5amp, high filtration dust cup upright means no keeping track of or paying for disposable bags. High-efficient, extra long-lasting commercial motor and True Balance double ball-bearing brushroll for less maintenance and downtime. The 30-foot cord lets you clean a large areas before having to stop and re-plug. Assembly Video. Sanitaire by Electrolux Commercial Vacuum Cleaners. Bagged and Bagless. Traditional Models Assembly. 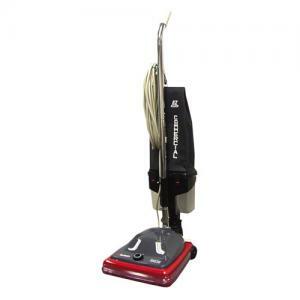 Sanitaire by Electrolux, Commercial Grade Vacuum Cleaners, Extremely Durable and Reliable Vacuums, Leading the Industry for many years, Sanitaire Vacuums are the Preferred Choice of Hotels, Motels, Restaurants and Professional Cleaning Crew. Been using this type for years it works great for us. thank you!